The G6BA or 2.7 D engine belongs to Hyundai Delta engine family. This 2.7-liter V6 engine also has the smaller 2.5-liter version - the G6BW (or 2.5 D). Hyundai installed in the G6BA in midsize sedans and SUVs until 2009 -cheap and reliable cars. The engine has the aluminum cylinder block. The 2.5-liter and 2.7-liter engines both share the same 75 mm stroke. They have different cylinder bore sizes only which makes the 200cc difference. The G6BA has DOHC aluminum cylinder heads with hydraulic lifters and four valves per cylinder. The crankshaft drives intake camshafts by timing belt only; intake camshafts drive the exhaust camshafts thought small chain inside each cylinder head. The timing belt also rotates the water pump of the cooling system. On top of the engine, there is variable geometry intake manifold. The variable geometry intake allows distributing the torque more evenly over the entire range of engine revs. The MFI fuel injection system responds to fuel delivery. 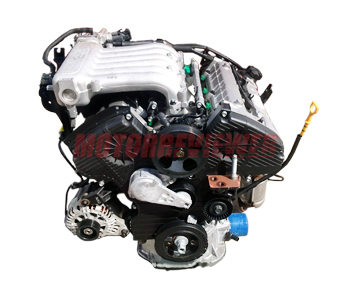 The manufacturer produced one more modification of the 2.7-liter engine - the G6EA (or Kia Mu engine). This version has CVVT system (Continuous Variable Valve Timing) on intake camshafts. The max power is slightly higher - 185-194 hp. The valves for changing the intake manifold geometry are often unscrewed by themselves in these engines, and bolts fall into the cylinders and cause significant damages. The timing belt warranty is about 60,000 miles. But it is not reliable in real life. The engine would bend valves if the timing belt broke. The G6BA longevity is impressive. The manufacturer claims what the G6BA engine life is at least 300,000 miles (480,000 km).